The announcement that royal couple Catherine and William are expecting their first child has many speculating about how this baby and his or her famous parents will cope. It can be hard for a normal, common family to adjust to family life. There are a few differences that spring immediately to mind, when one is royal. For Kate, like most new moms much of her hair will likely fall out during her first few post-partum months. However, unlike most new moms, she could potentially finance a small country with the money she would make selling it on eBay. Kate will have to decide what name goes best with the surname “Wales”. Sadly, the baby name “Hashtag” has already been taken. Luckily, “AtSign”, “DoubleBackSlash” and “Meme” are still available, should they decide Victoria, Elizabeth, George and Edward are too stuffy and old school. 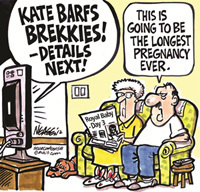 Kate will have additional parenting challenges due to the fact that paradoxically her child, by virtue of being third in line for the throne, will technically be the boss of her. Potty training days will bring new meaning to the term “sitting on the throne.” And while most babies are congratulated for speaking their first word, the first royal wave will also have to be celebrated. Come birthday time, likely Wills Jr. asking for a pony will be a little redundant. But planning the party will be easy for Kate’s side of the family, and Uncle Harry’s sure to be entertaining (and hopefully clothed). For William, “Bring your child to work day”, which doesn’t typically happen until the child is 14, will need to begin pre-planning now due to the security detail involved. And there’s really no point to Baby Wales taking Daddy in for Career Day, as no other kid in the class will be able to aspire to have the same “Next in line for the throne” job. Instead of sitting in line for hours to sign their child up for swimming lessons, they will have to spend hours interviewing the Royal Swim Instructor. Likewise the Royal Soccer Coach, Royal T-Ball Trainer and Royal Lice Remover. Should their child get lice, they can force everyone around them to cut off their hair. This, history tells us, is a vast improvement over ordering a whole head to be cut off. Good luck to you, Will and Kate. Watch for Funny Mummy every month. Follow Kathy on Twitter @KathyBuckworth or visit www.kathybuckworth.com Kathy’s newest book, “I Am So The Boss Of You: An 8 Step Guide To Giving Your Family The Business” will be released Random House in March, 2013.